Back in October we were overjoyed to announce that we made it through to the final of the Hertfordshire Business Awards 2018. Since then we had a judging visit from the category sponsors and attended the renowned Awards dinner on Thursday 22nd November 2018. We are absolutely ecstatic to reveal that we were crowned the winners in the Innovation Category! 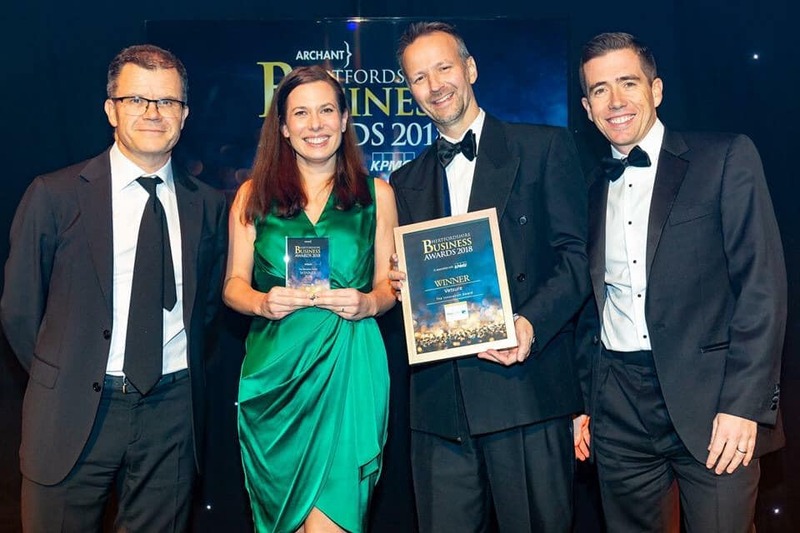 “We are overjoyed that out of hundreds of applicants we have WON the Innovation award at such a prestigious event, the Hertfordshire Business Awards! We hope this recognition will continue to motivate our hardworking, wonderful staff and give our customers that extra peace of mind that we will be there to support them in what can be a very distressing time.” – Dr Ashley Gray MA Vet MB PhD MRCVS, Managing Director of Vetsure Pet Insurance. This is an incredibly exciting time for Vetsure – not only have we launched our Pet Health Plans, we now have incredible recognition of our dedication to innovating the pet insurance world. We look forward to what the future holds in the next chapter of the Vetsure story… watch this space!